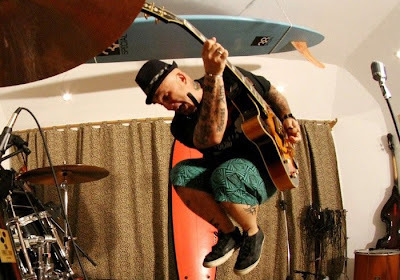 Senor Flavio (pictured above), founder of the seminal Argentine rock en espanol band Los Fabulosos Cadillacs, is out-surfing and out-rocking kids half his age. Don't take my word for it -- tune in this week and you'll hear a track from his stellar new album, Nueva Ola. Also this week: deep blues from northern Mali and north Mississippi, South American psychedelia, Ethiopian reggae paired with Swiss Ethio-jazz, and guaranteed dance floor fillers from North Africa and the Middle East.